There are anti-Lakers teams out there for sure. But on top of that, I think there are anti-Johnson teams too. It's not just fans of other states. Greg Popovich, Jeff Van Gundy and, to a lesser extent, Clippers broadcaster Ralph Lawler are also Laker haters. It's true, Windy and ESPN are some of the worst, they are out there criticizing Magic for telling Philly they have to get approvals for a conversation to happen AFTER Philly had INITIATED the request by emailing Pelinka.....and now the NBA is investigating it....for what???? 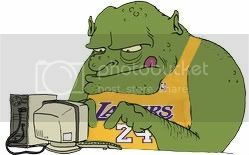 Are the Lakers not allowed to respond to emails or phone calls from other teams? It's beyond ridiculous....why aren't they investigating the Celtics for supposedly telling the Pels not to trade to the Lakers because they will offer more in the Summer...why is that not tampering if the bar is so low? The Lakers issued a statement later Monday that read: "To clarify, last November the 76ers sent an email to the Lakers asking if Ben Simmons would be able to speak with Magic Johnson about his Hall of Fame playing career. After receiving the email request from the 76ers, Lakers General Manager Rob Pelinka contacted 76ers General Manager Elton Brand and informed him that Magic could only do so if the 76ers gave him pre-written approval. That was the end of the matter." And of course the anti-Magic crowd has their nooses out. its success.. they hate success. because our team has been historically better than them. its the same reason why people hate USA. jealously is a helluva thing..
those other markets could get better.. look at small market Spurs.. hell.. Cleveland just won a chip.. and if they had better ownership.. they would have hung another banner..